Traditionally, this is the week when cruise lines and organizations release their latest news, creating one of the best cruise news weeks of the year. This year's Seatrade (now renamed CSM - Cruise Shipping Miami) took place from March 16 to 19 at the Miami Beach Convention Centre. The associated exhibition attracted about 4% fewer exhibitors but higher numbers, and occupied all four exhibition halls rather than just three. The overall theme this year was that despite the world financial crisis, booking numbers are up, even if yields are down because of price-cutting, and the future for cruising remains bright. There may be some individual bad news but the same industry that survived September 11 is again using some of the same tools to survive the present recession. What follows is an overview of news that broke during Seatrade Week on the event of its 25th Anniversary. Cunard of course chose last Tuesday to announce details of its latest ship, the second largest it has ever built and its third Queen in six years. To reflect what it was like on board the first Queen Elizabeth, launched in 1938, the new 2,092-passsenger ship will include lots of art deco in her interior design as well as lawn bowling, croquet greens and paddle tennis. 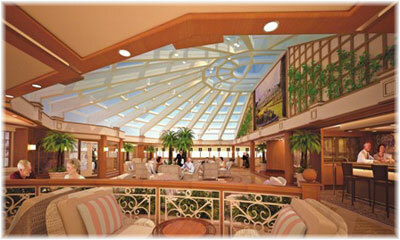 As on the earlier Queen Elizabeth and Queen Elizabeth 2, a Midships Bar will feature live piano music. Six "Commodore" suites will each feature a model of a ship that was commanded by one of the six Cunard commodores who were knighted, while a new Britannia dining room will be introduced for superior balcony accommodation, in addition to the Queen's and Princess Grills. To be introduced in October 2010, the new Queen Elizabeth's maiden voyage will be from Southampton to the Canary Islands. Some regrettable news came from Hebridean International on Thursday when the news finally broke that its Hebridean Spirit had indeed been sold after all, to private buyers for use as a yacht, and for delivery as early as next month. A victim not only of the recession and the resulting fare-cutting wars but also of the abysmal fall of Sterling ­ the Brown pound now being worth one-third less than the Blair pound was ­ Hebridean has finally had to withdraw from the international scene and return to its roots as an operator of high end cruises in the Scottish Isles. Redundancy interviews start today as Hebridean plans to cut its staff by half. Meanwhile, her three sister ships continue to operate commercially as Travel Dynamics' Corinthian II, Noble Caledonia's Island Sky and Cruise West's Spirit of Oceanus. This week, STX France also chose to reveal that what had been "orders" for two 92.490-ton "Musica" class ships, MSC Meraviglia and MSC Favolosa, in 2011/12, were not in fact orders after all as the financing had not yet been arranged. This followed statements by MSC bosses that they intended to renegotiate the price for these two ships in the present environment of falling prices caused by the recession. In fact, now it appears that they are more likely to be delayed, and when orders are finally placed, they will more likely be for 100,000-tonners according to sources in MSC. This is not good news for STX France, which has already lost an order for one F3 ship from Norwegian Cruise Line, but it may be for the industry as a whole as among the three ships that no longer appear to be on order this will mean 9,300 fewer berths arriving during a recession. In fact, it appears that the biggest losers of the present recession in the cruising world may well end up to be the shipyards that build these ships as their orders dry up. Elsewhere, while Silversea Cruises had been talking about a follow-on order for its new Silver Spirit, there is no further news on this subject and in the circumstances, with no financing, this second new ship is very likely to be delayed as well. Competitor Seabourn, on the other hand, through parent Carnival Corp & PLC, has financing in place for its Seabourn Odyssey and Seabourn Sojourn, with a third ship to follow. On the same day that Cunard revealed details of its Queen Elizabeth, the European Cruise Council confirmed that almost 4.3 million Europeans had taken a cruise in 2007, a 19% increase over 2006, and that this had generated about $36 billion in benefits to local economies, a 22% increase. This was a very similar figure to the North American market at $39 million, the narrow difference being accounted for by so many cruise ships coming from European shipyards and the employment of many European crewmembers. On Monday, it was also revealed that the German source market for cruising would reach 1 million in 2009, a figure the UK surpassed five years earlier, in 2004. The German market is now receiving a series of newbuildings for Aida and TUI Cruises' first vessel, the former Celebrity Galaxy, soon to re-enter service as Mein Schiff. Also on Monday, it was announced that the UK cruise market had grown to almost 1.5 million cruisers in 2008, an 11% increase in 2007. Of that number 900,000 were fly/cruises while 577,000 were ex-UK sailings. And the same day, it was announced that the French market had now grown 11% to 310,000 cruisers in 2008. European growth is expected to continue despite the world financial crisis. During the week, it also became known that Carnival would be moving its one-ship Carnival Spirit Alaska cruise operation from Vancouver to Seattle in 2010. In the end, although some have complained about Canadian taxes, it appears that Carnival's US passenger base is probably more attuned to drive-up and flying in through Seattle-Tacoma International Airport (Seatac). But there are also problems with Seattle's new cruise terminal at Pier 91, where Princess and Holland America will now be based, as it is a much longer transfer to there from Seatac than it is to the temporary facility that those lines had been using at Pier 30. The transfer of Carnival Spirit to join Princess and HAL could also be connected to Carnival Corp & PLC's recent signing of a ten-year lease in Seattle that gives them priority berthing at Pier 91. 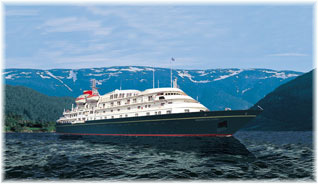 In addition, the Pacific Princess, once a Vancouver-based ship, will be based at Seattle this year. Her season end results in a rather interesting 1-night positioning cruise from Seattle to Vancouver on September 17, so that she can sail from Vancouver on a 10-day cruise to Honolulu the following day, a voyage that would be illegal from Seattle. Last Monday, Celebration Cruise Line's new Bahamas Celebration began 2- and 3-day cruises from Port Everglades to Nassau and the Bahamas. Built in 1981 as the night ferry Princesse Ragnhild, the newly-converted cruised ship replaces the Regal Empress, a ship that dated to 1951 as the Greek Line's Olympia, and one of the last Atlantic liners still in service. Meanwhile, the new Celebration Cruise Line name replaces that of the former Imperial Majesty Cruise Lines. As well as the Bahamas Celebration, the usual Nassau weekend crowd now includes Norwegian Sky, the newest ship to serve the Bahamas on a regular basis since she was transferred from the Hawaii trade as Pride of Aloha, the Carnival Imagination and Carnival Sensation from Miami and Port Canaveral and the Majesty and Monarch of the Seas from Miami and Port Canaveral. There are also calls now by the Carnival Fascination from Jacksonville, a relatively recent Florida cruise port. While there is no question that there are many problems to overcome in the world of cruising, the overall theme of Seatrade Week this year remained cautious but upbeat in an industry that is confident and optimistic about the long term. Despite yield problems, passenger numbers so far have been sustained and are even growing. And compared to the bulk and container markets, where rates have plummeted to all-time lows, cruise shipping is probably the most rewarding shipping market to be in in these tough times.